The Genifect Materialized Bevel filter is part of the Genifect visual effects post production plugin suite. The Materialized Bevel filter adds depth and realistic lighting to flat surfaces such as text and symbols by the use of MatCap textures. An image of the material that shall be applied on the surface. This is a reference to a .png image containing a MatCap texture. 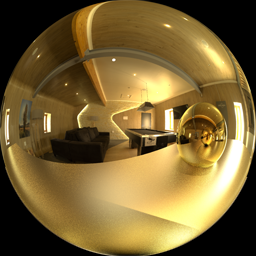 A MatCap texture is an image of a sphere that captures the environment lighting and reflections. 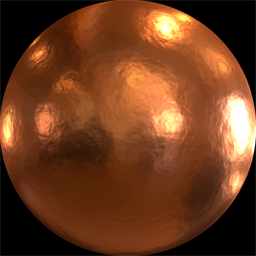 The following two MatCap images were used to create the copper and the gold effect in the examples. Limits the sampling radius in the MatCap image. This is good for tuning border reflections. Controls the spread effect of the sampling of the MatCap texture. This is good for catching the right light and reflectivity amount. The smoothing controls how sharp the bevel looks. A higher value means a flatter surface. The edge setting controls the amount of surface area that shall be elevated. Smaller values raises only a border. Material sampling spread in X-axis. Higher values means more spread the longer from the center a pixel is. This is also good for spreading reflection of flat parts. Material sampling spread in Y-axis. Higher values means more spread the longer from the center a pixel is.